According to the U.S. Geological Survey’s annual Mineral Commodity Summaries report, our nation still relies on foreign imports for most of the minerals needed for our national defense and economy. The 2019 report shows the U.S. is 100 percent import reliant for 18 minerals, 14 of which have been deemed “critical” by the Secretaries of Defense and the Interior. In total, the U.S. is more than 50 percent import reliant for 29 of the 35 minerals designated as “critical.” Despite a domestic abundance of many of these minerals and metals, our reliance on foreign sources continues. The report also showed that industries that use minerals and metals as raw materials contributed $3.02 trillion to the U.S. GDP in 2018. This statistic exemplifies the importance of minerals and metals that are the foundation of supply chains in nearly all sectors of our economy. In addition to enabling U.S. competitiveness, strong U.S. mining policy bolsters state and local economies. Take Alaska for example, where the cumulative value of mineral production in 2018 was $3.4 billion dollars. The state produces gold, lead and zinc – each of which contribute to our GDP in multiple ways – and is our country’s top silver-producing state. Silver is required to manufacture electronics, medical technologies and military-grade aircraft. Production of this high-demand material generates economic activity in the state and brings hundreds of jobs to local communities. In Nevada, copper, gold and silver are produced in large quantities and the cumulative value of mineral production in 2018 was $7.88 billion dollars. The mining industry supports these state and local economies across vital industries. In fact, for every job created in the mining industry, two more are created elsewhere in the economy. See your state infographic here. 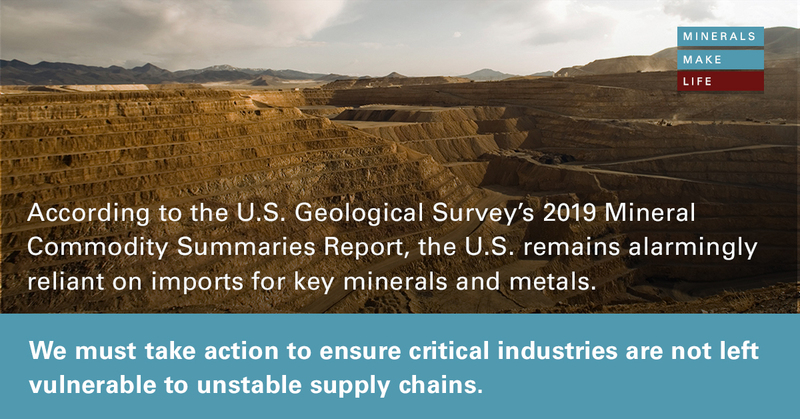 As evidenced by this year’s Minerals Commodity Summaries report, it’s critical that our mine permitting process is reformed to ensure stable supply chains and timely access to key minerals. It currently takes anywhere from seven to 10 years to obtain a mine permit in the U.S. If we want to both decrease our import reliance and support our economy, Congress must fix this broken system. To learn more about the risks and challenges created by our outdated and inefficient mine permitting process, check out our latest infographic.